A police officer in Brazil was suspended on Friday pending an investigation after he was caught on video firing a rubber bullet at a protester who had accidentally knocked his cap off. The incident took place during a protest march Thursday night in the northeastern city of Recife, where local activists from the Occupy Estelita movement are trying to block a private real estate development project at the José Estelita Pier in the city’s historic center. The protesters want the space to be a public park. The images show that protesters carrying a large banner across a road raised it as they passed an officer, glancing against his head and knocking off his cap. Seconds later, he calmly raised his rifle and fired a blast at one of the protesters only steps away. Video of the sudden outburst, which was filmed from at least two angles, generated outrage on Facebook, where it was viewed hundreds of thousands of times. 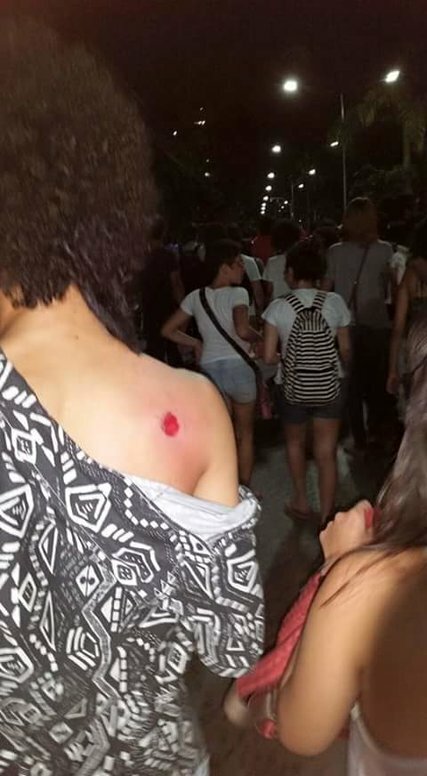 The protest movement later shared an image of the wounded activist’s shoulder, saying that he had been shot at point-blank range with a rubber bullet from the officer’s shotgun. After the protesters regrouped, the crowd chanted for the military police forces charged with maintaining order across the country to be disbanded. Edilson Silva, a socialist deputy in the state legislature, hand-delivered a copy of the video to a senior police official on Friday, demanding that action be taken against the officer.